Telenor brings an exceptional invention and facility for parents. This is first telecommunication of Pakistan who has introduced tremendous Telenor Companion Smart Watch for people of Pakistan. This is specially has made for children security and customers can easily check all the children activity by using it. As we all know many parents really worry about his/her infant children and usually want to check every-time children so this is best technology has launched from this network side for its valued people of Pakistan. Parents can easily buy this Smart watch and keep easily use it to check their children activity by using it. This is such a preferable technology watch has launched from this network side and there are largest numbers of Pakistani parents are appreciating this invention of Telenor. It provides multiple facilities for its users and parents can easily get various facilities like silent monitoring, alert miss call, voice calling and many others more. 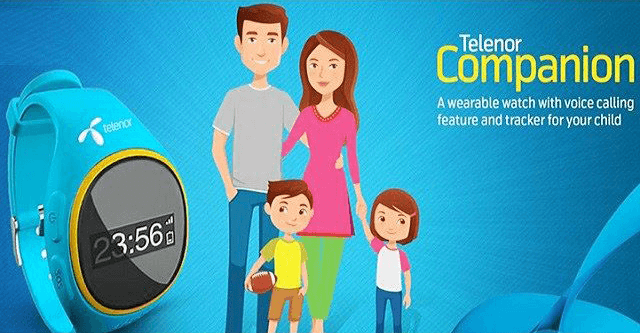 The following important features of Companion Smart watch of Telenor are mentioned as below. This is an amazing feature has added in this Smart watch for its customers. The operators can easily track and monitor his/her children location through mobile application of his/her personal cellular phone. SOS is the service, There you can generate or add Smart Watch phone number for making call at anytime without facing an issue. Geo Fence is main feature of this watch. The operators can easily get notification, alarm and alert when his/her kids go out of radius. It also provides facility for the voice calling and parents can talk at anytime with his/her children with successfully. Pedometer feature calculates step of his/her children and other details. The is also efficient feature in this product. The price is easily affordable for people and they can purchase this watch in just RS 7000 plus tax. The device price is RS 6000 and security deposit is RS 1000 so the total price is RS 7000. The monthly line rent is RS 300 plus tax. Buyers get 300 free minutes for a month. Customers also get 300 MBs internet volume for monthly usage. All the interested buyers can also purchase this product from nearest official franchise of this network. Customers can check and track multiple watches from single device through application. Only one administrator allow in this feature. The charging time of the watch is 1-2 hours. The discharging time of the watch is 2-3 days. As per PTA requirement, a single customer can only buy 5 watches only. You can also get other information regarding this product from official website of Telenor.